I wrote a small console application to access my BK power supply very fast. This application comes without a GUI (Graphical User Interface). Instead it looks like a DOS-window where you can enter text commands. It has a small instruction set with commands you can enter. You might wonder: what is it good for? The BK power supply already has buttons to enter values very quickly. That is true, but in some cases it is faster if you can enter the desired output values on a real keyboard. The console application has a second advantage: you can use it from a remote computer using a Telnet server/client. This allows you to control your BK unit from anywhere in the world. CONNECT: creates a connection with the device. SETUP: runs a setup wizard which asks for the COM port, the BAUD rate and the hardware address of your device. 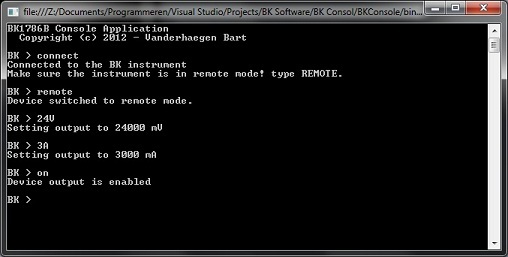 REMOTE: set the unit to remote mode (necessary before you can send commands). LOCAL: set the unit to local mode (necessary to set commands on the power supply). ON: Enabled the output of the unit. OFF: Disabled the output of the unit. V: Show the actual voltage of the unit. A: Show the actual current of the unit. HELP: Shows a list of all available commands. Sending voltages or currents is very easy: just type the voltage or current you need. You just need to type 24 V to set the output to 24 V. The same goes for the currents: just type 120 mA to set the maximal output current to 120 mA. My application automatically recognizes the desired unit. BK Console is written in Visual Basic 2010 .NET (framework 3.5). Here you can download the application and the source code. I didn't include a setup wizard for this project. You can just double click the executable to run the application.